I recently read that “cinnamon bites and kisses simultaneously”, which is a pretty good way to describe the warm, sweet taste of cinnamon. It is equally at home in sweet and savory dishes, and many people attribute health benefits to this popular spice. Cinnamon partners perfectly with bread in my book, whether in the form of simple cinnamon sugar toast or a tender homemade cinnamon twist. Greenlee’s Bakery in San Jose, California raises the combination of cinnamon and bread to an art form. Real butter, fresh milk, eggs, and generous swirls of cinnamon make this a moist, tender, incredibly delicious bread. The family owned bakery has been in operation since 1924 when Emmett Greenlee started offering baked goods in his coffeehouse His son later assumed responsibility for the bakery. In 1981, Norbert and Rosalinda Geldner purchased the business. Norbert came to the United States from Germany in 1967, and Rosalinda immigrated from Mexico when she was 12 years old. They brought their experience from a bakery they had previously owned, and also Norbert’s recipe for cinnamon bread. As the word spread about the out-of-this-world cinnamon bread, the bakery’s operation shifted from a heavy focus on wedding cakes to a concentration on cinnamon bread. The bakery produces about 2,000 loaves per week to service local customers and farmers’ markets, and that production level escalates during holiday seasons. We first tasted the cinnamon raisin bread right out of the package–heavenly! The next taste test was buttered cinnamon raisin toast, which was also stellar. The bread toasted beautifully with a crisp-tender texture and plump raisins. I’ve seen several recommendations for Greenlee’s cinnamon bread French toast, and that may well be on the menu this week. Greenlee’s website has a link to an ordering site, which sadly did not work as I was writing this, but hopefully it will be operating soon. In the meantime, check with your upscale market to see if they have Greenlee’s bread in stock. This cinnamon raisin bread should be on your must-try list! We promise we’re not going to turn foodswelove.com completely into a chocolate blog, but it is the time of year when exceptional chocolate is everywhere and we just have to share it! The latest find came at REI, for goodness sakes, the last place one might expect to see gourmet chocolate. The cashier’s enthusiasm when he saw we had picked up this chocolate bar was an early indication we were onto something good. The Chuao Chocolatier website’s tagline promises “unusual, unexpected & delicious chocolate”. The “unusual, unexpected” part was evident from the chocolate bar wrapping which identified breadcrumbs as the source of the “crunch”. We only had “delicious” to confirm, and confirm it we did. The 60% cocoa is decadently dark and exquisitely smooth. Had it been only a dark chocolate bar, it would have been completely satisfying. The addition of salted breadcrumbs to the chocolate was candy-making genius. The breadcrumbs are so small and fine they are practically invisible in the chocolate bar, but their delicate crunch is divine. The company logo and cocoa beans embossed into the chocolate make this one beautiful candy bar. Chuao (chew-WOW) Chocolatier was founded in 2002 by Master Chef Michael Antonorsi and his brother Richard. These Venezuelan brothers’ ancestors grew fine cocoa on their family farm, so chocolate is part of their heritage. Chef Michael loved food and cooking from an early age, but pursued a business degree, then established a successful high-tech firm with Richard. In his mid-30’s, his love for the culinary arts won out over his business career, and he took his family to Paris so he could complete classic French culinary training. After Chef Michael finished his education, he and Richard opened their first chocolate café and boutique in Encinitas, California. With Chef Michael’s creativity and Richard’s business skills, the venture has flourished with additional cafés and a national wholesale business. Their success is rooted in their respect for the family’s history in the cocoa trade and their commitment to using ethically sourced cocoa from their native Venezuela. Chef Michael has some delectable treats to tempt the adventurous chocolate-lover. The Honeycomb Bar is a combination of caramelized honey bits and dark chocolate. The milk chocolate Maple Bacon Bar has crispy bacon bits with a touch of maple flavor and bonfire smoked sea salt. YUM! There are more selections of chocolate bars, bonbons and hot chocolate to delight friends, family or yourself. You have to check out the stylish design of the website and product packaging, and order some of this delicious chocolate or ask for it at a fine retailer. 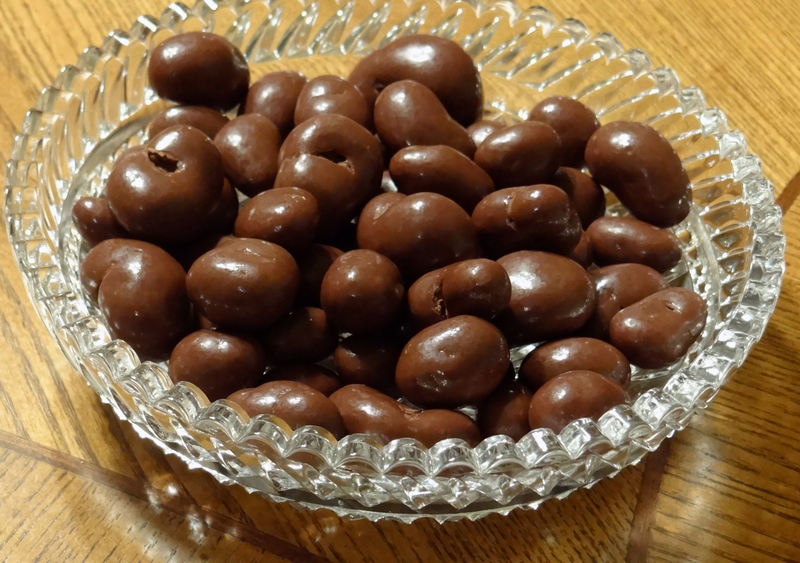 If the mention of chocolate covered raisins conjures up memories of an overpriced box of dry fruit covered in waxy chocolate at the movies, it’s time for a reboot. Sconza’s Chocolate Caramelized Cashews rocked our candy jar, and it was just a matter of time before we tried another selection from their product line. Allen isn’t a fan of raisins, so it fell to me to be the primary taste tester. I’m always up to the challenge if chocolate is involved! Sconza’s bag promises plump, oversized raisins and they deliver. They are large, juicy, and delicious. The chocolate? Definitely dark, lusciously creamy and possibly addictive. These candies bear no resemblance to their vending machine counterparts. Although I enjoy a number of chocolate covered fruits, chocolate covered raisins have always been my favorite and Sconza’s Dark Chocolate Raisins are definitely the best I have ever eaten. Not only are they delicious, they can also be part of a healthy snacking program. Double bonus! Raisins are a good source of iron, which is essential in producing hemoglobin to transport oxygen through the blood to all the cells. They are a high fiber snack, so are a helpful digestive aid. Women can benefit from the calcium and boron in raisins to maintain bone health. Like other dried fruits, raisins provide beneficial antioxidants. The oleanolic acid found in raisins destroys the bacteria that causes tooth decay. To that impressive list, add the healthy aspects of eating dark chocolate (in moderation, of course), and this is a very low-guilt goody. Three generations of the Sconza Family have been committed to providing high quality candies, following the traditions established by Italian immigrant Vincenzo Sconza in 1939 in San Francisco. Visit the company’s website and order some treats for yourself or as a tasty stocking stuffer for someone special. The packaging on this cheese tells the story, “4 generations of the Rumiano Family bringing you the best tasting organic hand-crafted cheese on the planet!” I could probably end the commentary at this point and start enjoying some really exceptional organic cheese, but since I can’t share a taste with you, I will continue telling the story. 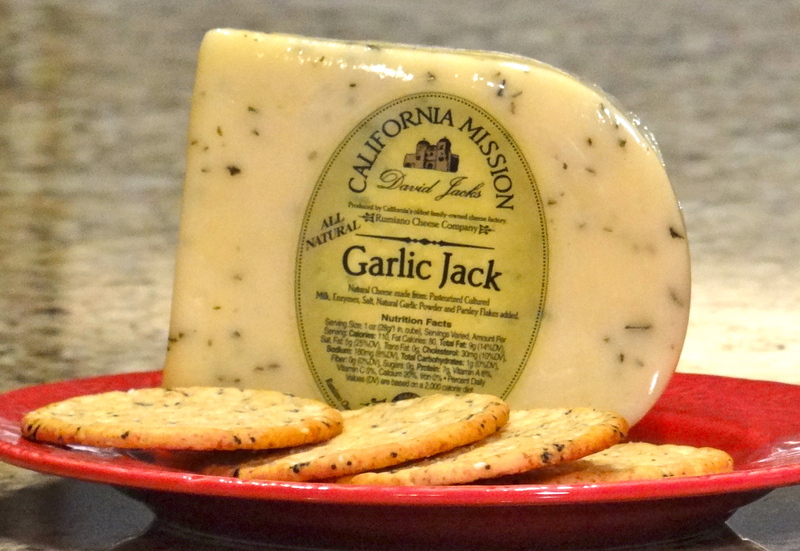 We were introduced to the Rumiano Family when we tasted their Garlic Jack Cheese, which was truly awesome. When Owen Rumiano contacted us to share some information on the family’s organic line of cheeses, we searched out their organic Monterey Jack at our local Whole Foods Market. You might think the fourth-generation owners of the oldest family-owned cheese company in California would be resting comfortably on their laurels. Instead, they are leading their industry with the only certified non-GMO cheeses in the world. This video shows the justifiable pride the family has in its operations including sustainable farming practices, humane treatment of the “happy” grass-fed cows that produce milk for their cheeses, a robust recycling program, and energy efficiency that includes some of their employees riding bicycles to work! However admirable a company’s business model is, it must also have a good product, and the Rumiano Family definitely delivers. Monterey Jack is a light-colored, semi-hard cheese with a mild flavor. Rich Jersey cow milk gives Rumiano’s organic Monterey Jack a very creamy texture and buttery flavor. We enjoyed it in a very simple presentation, cubing the cheese and serving it with slices of smoked sausage. It was so very tasty! 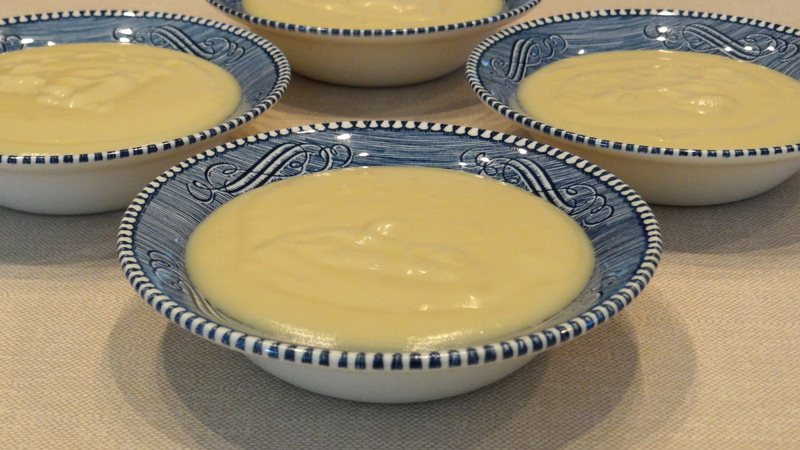 As smooth and creamy as it was at room temperature, it would surely melt beautifully in a queso recipe or casserole. A Cheesy Portobello Mushroom recipe on the company’s website looks like an excellent way to test that melting quality! There is a store locator on the website so you can find Rumiano Organic Monterey Jack cheese in your area, or you can order directly from the Rumiano Cheese Company. This cheese is guaranteed to please your palate and your social conscience! For me, every visit to a gourmet market involves an extended stop on the chocolate aisle. Maybe I feel a tremendous responsibility to keep you informed of all the great chocolates available on the market today. Maybe I’m just a chocoholic. Yeah, it might be the latter. John Kelly Chocolates caught my eye on a recent shopping trip. The gold foil wrapping on the truffle fudge bars was just a hint of the decadent taste we were about to enjoy. We chose their peanut butter and chipotle ancho chile flavors to try. The silky chocolate coating on the handmade bars was beautiful. We noticed the two bars had different designs, which is part of the John Kelly signature. Each flavor has a distinct symbol swirled onto the top of the candy. 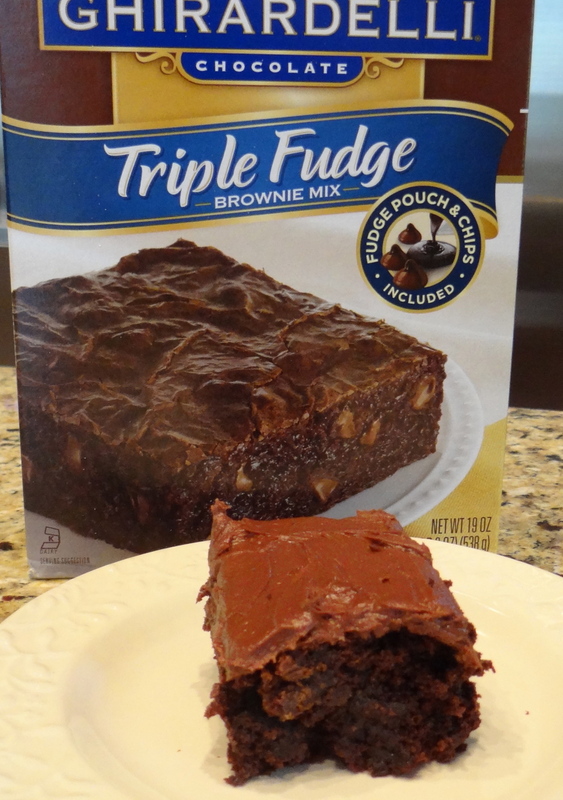 We sliced each bar to reveal a truffle fudge center coated generously with semi-sweet chocolate. Both flavors were amazing. Allen leaned toward the peanut butter (of course). A thick layer of peanut butter fudge rested on dark chocolate fudge for a very classy upgrade of the ever-popular peanut butter and chocolate combination. Because I love sweet and savory duos, the chipotle ancho chile was my first choice. The dense fudge was a good match for the complex pepper flavors. The wrapper indicated the peppers are “mild”, but some people might find them just a little too spicy. Allen was one of those, so he happily agreed to finish off the peanut butter truffle fudge bar. The 2-ounce bars we purchased are promoted as individual servings, but honestly, these chocolates are so rich they could easily be treats for two. Of course, I was wondering how John Kelly got his start in the chocolate business. I was surprised to learn there is no John Kelly; instead John Kelson and Kelly Green combined forces to create a luxury chocolate line, and combined their first names to identify their company. 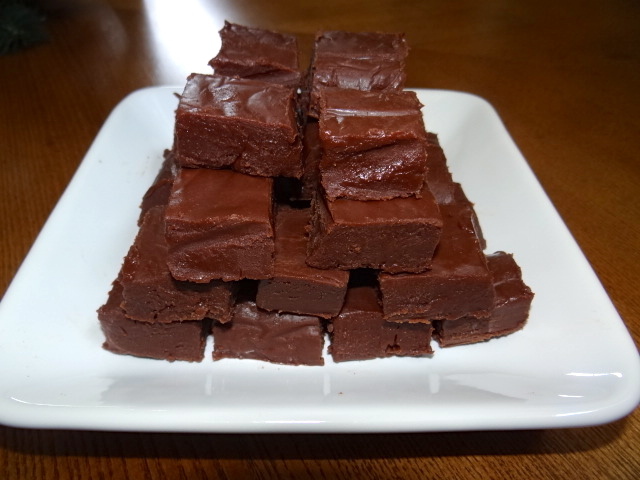 According to a Foodcrafters video interview, they began with a friend’s usually smooth fudge recipe, elevating it almost to ganache status. They have developed a very nice variety of additional flavors including cappuccino with walnuts, chocolate with walnuts, chocolate, dark chocolate with walnuts, dark chocolate, raspberry, white chocolate vanilla with walnuts, chocolate and caramel with Hawaiian alaea sea salt, dark chocolate with French grey sea salt, peanut butter with Himalayan pink salt, and walnut caramel clusters with Mediterranean sea salt. Could you look through that list and honestly say you couldn’t find at least one you would love? I don’t see one I wouldn’t love! In addition to the 2-ounce bars, John Kelly Chocolates offers 8-ounce bars and 1-ounce “bites”. Their products come in gorgeous packaging, which would impress your most discriminating business client or friend. The candy is widely available in upscale retailers and gourmet markets, and you can also order directly from John Kelly Chocolates. As we go into the holiday season, we may go a little heavy on reviewing sweet treats. Finding stocking stuffers and thoughtful gifts for neighbors, teachers, friends and co-workers can be a real challenge if you want something a little different. Our challenge is to provide you with some new options, from truly artisan, handmade treats to more traditionally manufactured goodies produced by family businesses. One such family business is Sconza, a candy company established in 1939 in the San Francisco Bay area by Italian immigrants, Vincenzo and Maria Sconza. The couple made and sold peanut brittle from their kitchen, and today a third generation of Sconzas is keeping the family promise to craft only the highest quality candies. The Sconzas sell candy under their own label, but also contract with other companies, so we may have already eaten Sconza candies without being aware of it. The company’s website features several videos about the candy-making process that are very interesting. Watch them with your children! It was also impressive to see the hands-on participation of Sconza family members in the day-to-day business. Vincenzo and Maria Sconza would no doubt be proud of the way their tradition of quality has been upheld through the years. 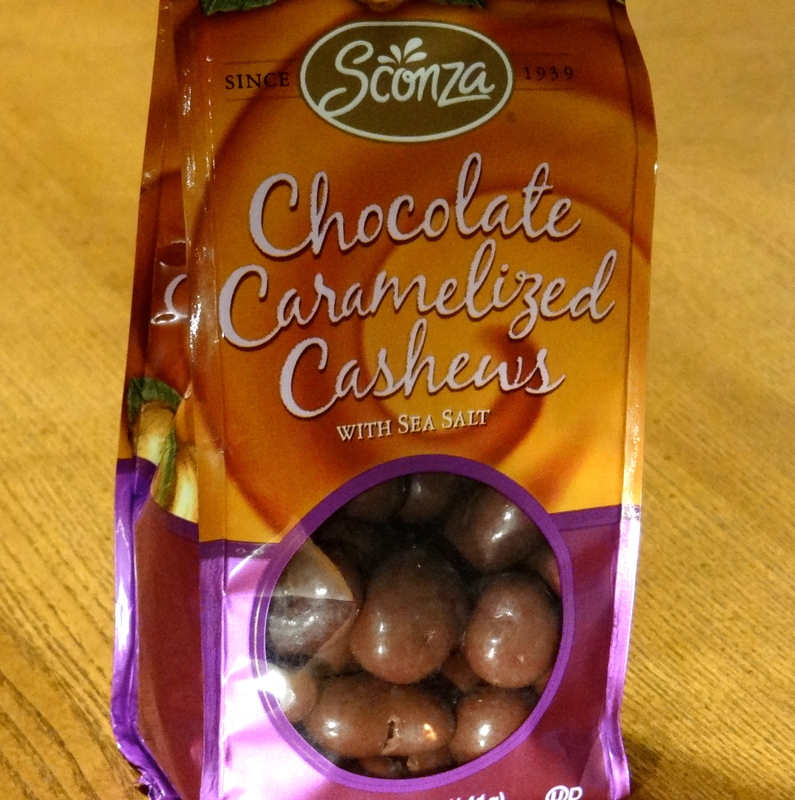 We chose Sconza Chocolate Caramelized Cashews to try for two reasons. First, Allen and I both really love cashews. Second, I didn’t realize Sconza also offered Lemoncello Almonds: roasted almonds covered in white chocolate and lemon cream! I’ll be trying those soon..very soon. The chocolate caramelized cashews were terrific, though. The nuts are perfectly roasted and crisp. They have a crunchy caramel coating, which seems similar a thin toffee shell. The cashews are finished with a generous drenching in smooth milk chocolate. Somewhere in the process, they receive a sprinkle of sea salt. I don’t see how it could be possible to just eat one! Sconza has a fantastic assortment of candies. From premium chocolate covered fruits and nuts to their trademarked “Jordanettes” (Jordan almonds), there is something to appeal to every sweet tooth. Their holiday candies include eggnog almonds, candy cane almonds, and spiced chocolate cranberries. Yum! The 5-ounce bags they offer are the perfect size for stocking stuffers. Sconza does not sell products directly on their website; instead they direct customers to Groovy Candies online. You can also purchase from Amazon if you can’t find them locally.